Every chainsaw on the market has either an automatic pump or a built-in oiler that keeps the chain lubricated. Without proper lubrication, chainsaws can create too much friction and prevent the chain from moving smoothly around the bar. If you suspect that your chainsaw isn't sufficiently oiled, there are steps you can take to find the problem and fix it. Generally speaking, the signs of a chainsaw oiler problem are easily spotted. If the chainsaw seems like it's getting too hot or producing smoke, that is a sign that there is an oil deficiency in the chain. This is not good for the life of your chainsaw. If you spot this problem, it is time to troubleshoot the issue. Begin by turning the chainsaw on and allowing it to warm up. After depressing the throttle all the way, hold the chainsaw bar close to a piece of wood. If you don't see any oil splattering onto the surface of the wood, the chain bar is not sufficiently lubricated. At that point, you will turn off the chainsaw and let the chain brake go. Turning the chainsaw upside down will help you to locate the oiler mechanism. You will see a dial with a minus sign and a plus sign. Turn the dial towards the plus sign to increase oil output. Then, turn the chainsaw back on and let it get warmed up before you perform the test again. If that did not sufficiently lubricate the chain, it's time to try something else. You will remove the clutch cover and take the chain off of the bar. If the chain appears damaged or worn, that may be the issue. It may be too damaged to slide easily across or along the bar. If this is the case, you need to replace your chain. Before replacing your chain, clean the bar and free it of any dirt, sawdust or built-up oil. If the chain appears to be in fine condition, it's time to check the oiler itself. First, inspect the oil lines to see if there are any cracks or open seams. Next, drain the oil tank itself and clean it thoroughly. If this does not fix the problem, you may need to replace the oil filter and the oil vent tanks completely. Run an oil test every time you turn on your chainsaw. 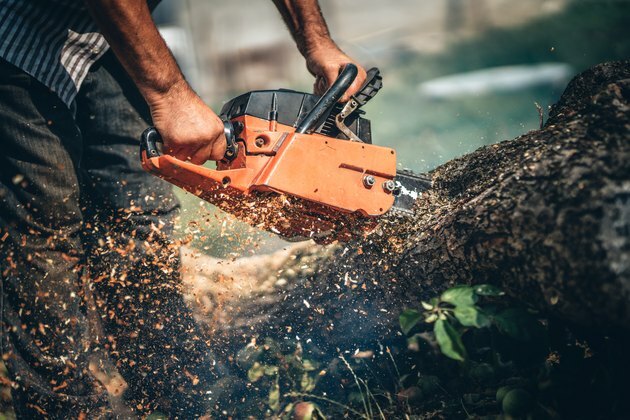 By not carefully inspecting the chainsaw with each use, you run the risk of running the chainsaw on no oil for a long period of time and causing significant damage to the mechanism. Always be sure that the oil you are using in your chainsaw is the recommended kind for your chain model. This will keep your chainsaw running smoothly and safely for years to come.